I often find myself wondering whether other bloggers have little habits and routines like I do, so I decided I'd put together a little post about my blogging routine, how I like to keep myself organised(ish), and the bits and pieces I have around my desk for while I'm blogging! I'm super-duper nosey, so if you've done a post like this (or post one in the future! ), I'd love to see it - please do leave a link in the comments. I tend to blog from my desk, as years of University work mean this is where I can concentrate the best. I often light a candle whilst I'm writing, it's just nice to indulge every now and again; this isn't a fancy candle, I think it was from Poundland! A nice hot cup of tea is an essential for me, my house is freezing so I often cosy up in a blanket too. Is that weird?! An obvious essential for blogging is my laptop; I've had this since I was 17 and I have to admit it's developed some "quirks" recently - it's definitely seen better days! I'm trying to save up a little bit from my new job so I can afford a new one, and have been looking up some Acer laptop reviews for its replacement. I'm a massive lover of colour-coding and always have been, everything in my diary is colour-coded from hours at work, to to-do list items, phone & credit card bills, my boyfriend's days off, birthdays... Everything! 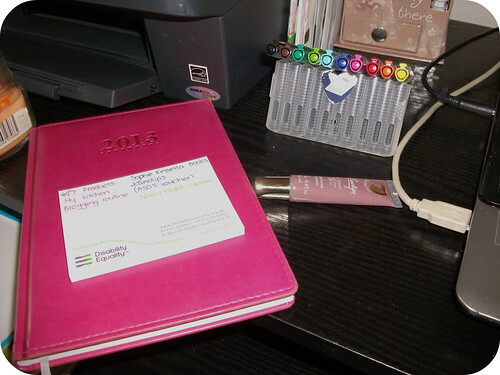 I have a pad of sticky notes on my desk which I use to jot down ideas and things I need to remember to do - photos, sponsored posts, reviews, collaborations and guest posts - which, again, is colour-coded. I also have monthly planners on the wall above my desk so I can see what's happening and what I need to do at a glance - I love these fab bright ones from Tomkat Studios, and again I'm obsessive with my use of coloured pens... I like to write in my hours at work so I know when I'm free, as well as what posts I'm planning to publish when. Sometimes these are the same every month, for example I always publish my Empties posts on the last day of the month. It also helps make sure I'm not posting too many reviews, sponsored posts etc., as I can see at a glance what's been posted when. 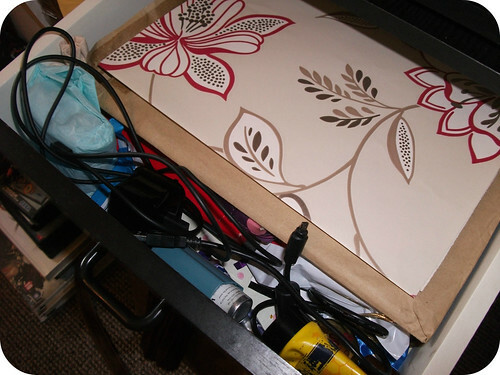 The top drawer of my desk contains things like products I'm currently reviewing, camera cables, and the wallpaper samples I use as backgrounds for my product photos - you can request these for free from B&Q's website, which is what I did! I also have a stack of magazines on the pull-out shelf of my desk, which I tend to use for inspiration; I don't think I'm a naturally fashionable person, so I need it! If I'm blogging about a particular product, I tend to have it on my desk so I can check ingredients and product information as I write, because I like to include as much information as possible about each product. I usually start writing a review as soon as I get a product, writing about its packaging, claims and ingredients. Then I add in first impressions as I begin using it, photos as I get chance to take and edit them, and longer-term thoughts after using the product for a few weeks. This means I usually have a good few half-written posts in my drafts, so I know what I'm supposed to be working on! Do you have any particular blogging routines or habits? 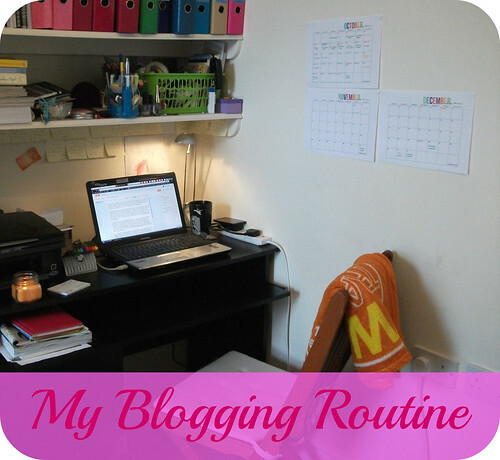 Have you ever posted about your blogging routine or blogging area? I'd love to see if so, so like I said, please do leave me a link in the comments! Remember to check out the wonderful LaylaD Beauty for gorgeous natural skincare & cosmetics. I need to make a blogging routine! Your routine is more organized than mine. Currently I have boxes of products in a chair. I need to get a big stack of shelves. And the calendar would be great. Thanks for the inspiration! Love it. I'm so very un-organised when it comes to blogging - I always have been so I can't see me changing any time soon. I blog between my laptop and our home computer, normally when I should be busy with my stores but ya know ... I have started to try and use a notebook more for ideas but yeah, that's as messy as the desk to be honest! nice post! 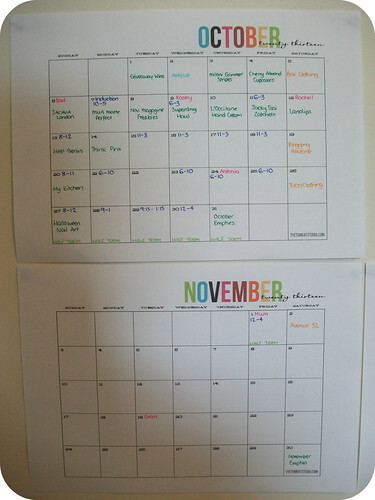 love finding out how other bloggers stay organized! Part of my problem is I have zero routine with my blog. That and the fact I can't for the life of me settle down on one blogging platform and just bloody get on with it. LOL! I like the calender you have, that's quite a good idea as you can see it right from where you're working.